What's Better Than a Square Deal? For a few years, I've been using Square Cash to send and receive money between myself and friends. But suddenly, in the second week of March 2018, Square Cash radically changed the way it handles money transfers for its 7 million users. They offered me $25 to accept their new “laser engraved” Visa debit card, and enabled trading in cryptocurrency via its Cash app! So I think it’s time to update all of you readers on Square’s ambitious makeover. The original Square Cash required two parties who each had a debit card (not credit card) issued by a bank based in the USA. One party could request money from the other, and the other just clicked or tapped to pay. A supplier of mine once sent me an invoice via Square Cash and I happened to notice it immediately. From the time the supplier hit “send invoice” until he had money in his bank account - not in a “holding cell” such as Paypal does - only 47 seconds elapsed. Like I said, Square Cash just works, perfectly! Unfortunately, what is perfect can only get worse. Now, money sent via Square Cash goes into a Cash App Account, just like one’s Paypal account. It can be spent via the Cash App or the new Visa debit Cash Card, just like Paypal. But you have to press or tap a few times to transfer money from that “holding cell” to your bank account, where you can write checks against it, use your bank’s debit card, or get cash over the counter from your bank account. Square says its default method of transferring funds to a bank account - what Square calls “cashing out” - takes anywhere from 1 to 3 business days. Somehow, the variability of that delay depends upon your particular bank. But you don’t have to wait or take a chance that your money won’t arrive in your bank account until it’s too late. For a fee of 1% of the amount “cashed out,” Square will provide instant transfers to your bank account, just as it had been doing. You don’t have to remember to cash out. You don’t have to make those extra clicks or taps. Most of all, you don’t have to keep track of where your money is - in your bank account or in your Cash App account. I hate that sort of bookkeeping! Paypal, of course, charges a fee to the recipient of money; currently, the fee is $0.30 per transaction plus 2.9% of the amount involved. So you get less money than the sender sent. Bummer! But what Square is doing is sort of the opposite of Paypal, yet the same. Paypal does not charge a fee when you transfer money from your Paypal account to one of your bank accounts. Square Cash does, but that 1% is less than a third of what Paypal charges you when you receive money. So Square Cash is still the better option, in my opinion. The addition of a Visa debit card branded by Square is apparently an attempt to throw shade over the Paypal Master Card debit card. Square is even offering (some users) $25 cash if you take its Visa card! 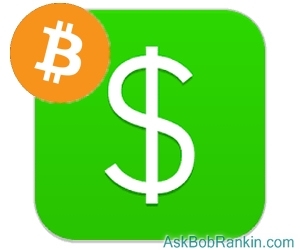 That money appears instantly in your Cash App account, provided you are approved for the card. The qualifications are minimal. Basically, if you already have a debit card issued by your US-based bank, Square will give you one of its nifty all-black “laser engraved” Visa cards. Why do I say "some users" get the $25 incentive to get the Cash Card? Well, it appears that they are selective about it. One friend of mine used the Cash app to request his Cash Card, but was not offered the $25 reward. It may depend on how long you've had your Square account, how frequently you use it, the phase of the moon on the day you try, or random chance. In any event, the card is free, and will make even squares look cool. Oh, and lasers. I don’t see any mention of cash-back rewards based upon the dollar volume of money paid via your Square-branded Visa card. Paypal pays 1% cash-back each month on purchases that are processed as “credit” rather than “debit.” That used to be 1.5% but Paypal lowered the percentage over a year ago, even for long-time 1.5 percent-ers like me. Ready to Dip Your Toe into Cryptocurrency? Such a bold move might go a long way towards restoring trust in the Wild West world of crypto exchanges and trading partners. Square, Inc., is a well-known brand among merchants; but then, so is Paypal. I guess we’ll just have to wait and see how Square’s mirror-image plan for defeating Paypal goes. Meanwhile, I suggest you let transfers from Square Cash to your bank account proceed at their “1 to 3 business days” pace. You may still get practically instant transfers, or you may find yourself stuck in the "float," waiting up to 3 business days (which can be five calendar days). Most recent comments on "Square Cash Goes Paypal In Reverse"
Might want to stay away from the app right now. Comments on Play are not very kind over the problems going on over the past few days. Actually, on select weeks it can be 6 calendar days, more time than sending payment through the mail, and obviously more expensive. It's the price we pay for convenience. There are NO fees to the recipient if you send cash from one PayPal account to another. First paragraph in the "Comparing Sequate to PayPal needs to be clarified. Although I have a PayPal account, I very rarely bother with it. My credit union offers the use of Popmoney without fees. I can easily transfer money (with some limits, typically up to $2000 for next-business-day receipt, and up to $5000 for 3-business-day receipt) from my checking account to someone else's bank account. Or I can transfer it just using the recipient's email address or mobile phone text number, and recipients will be sent instructions on how to notify their bank to accept the money. This seems pretty simple and cost-free. I have had a PayPal account for a long time but never used it to pay friends. Then one day I did and was shocked to find out that they charged my friend money to get his money. I ponied up with cash to cover the cost and decided that maybe PayPal wasn't what I thought it was. From now on I'll pay with cash or a check. Don Robinson is correct: NO fees charged by PayPal to send cash from one PayPal account to another. I have done this many times without charge. I have used PayPal for years sending money to family and friends without it costing either party any money at all. Within the last few months, I realized, PP is charging me to send money to the same family and friends where it was once free. It is a nominal amount, but the difference was a surprise. I use Zelle to send to anyone with a cell phone or email address for free. It's being used by many banks. Santander Bank makes it very easy to transfer money from your account to someone else who also has an account there. No cost to either party. Probably other banks do this, also. PayPal is and always has been free to send money to friends and family. Just be aware to click on the correct button for "Friends & Family" when sending. There is no fee if you use that button. I have been with PayPal since its inception and find it to be the easiest to use and our friends and family use it to send money between us many times a month and never pay any fees. I use Bank of America Bill Pay. If it can't be sent electronically, BoA mails it with no charges to either party. My credit union will do EFT if the receiver is set up for it. Otherwise they send a check. It's a member service and as such is free. Whenever I shop online I use Paypal because its offered as a way of payment by most online merchants (except for Amazon) because you can use any of your credit or debit cards or checking accounts and "mask it" with Paypal. All you have to do is hit a button or use the default bank account. I NEVER saw any merchants use Squate or Square, whatever. I've used Square for buying and selling in person, and love the ease in use--wish it could be an on-line merchant choice. Like souprman, I have been using PayPal to shop on-line, because of the ability to "mask" the cc/bank numbers (and also, because it is easier to remember the password for one site, than 16 digit numbers + date + security codes for 3 different credit cards). However, for the last couple of weeks, the "checkout with PayPal" buttons/options have not worked-- I just get to a message from PP to "try again later" after singing in. No response from PP re: why this is happening. Did all the clear cookies/history bits, and tried 3 different browsers-- all go to the same ms.
As mentioned by ron, in Canada most banks have e-transfers set up to do the same thing. However, my bank (Simplii) does not charge any fees for this service.